The iconic Four Winds Sound Shell just south of Bermagui is bruised but not beaten after a runaway car came crashing through on the weekend. 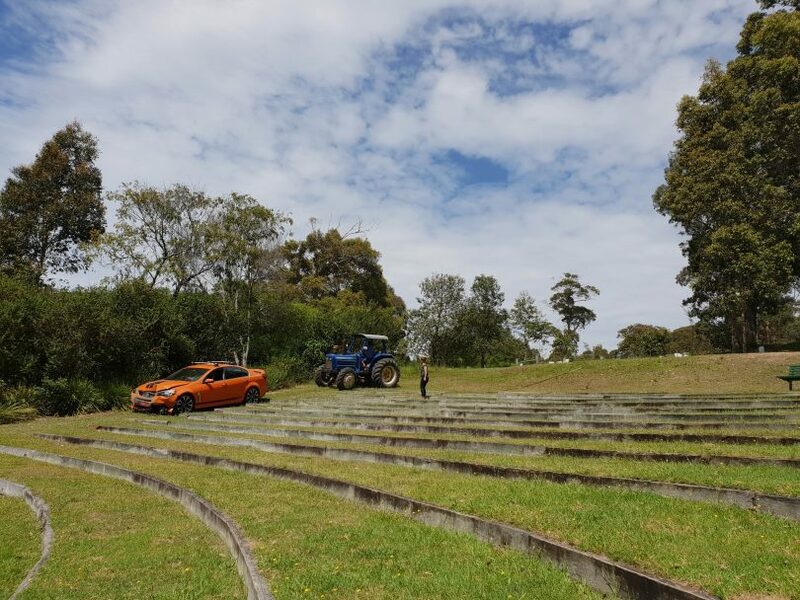 On Sunday as patrons enjoyed a performance by Malumba in the nearby Windsong Pavilion an unattended car rolled down the hill through the empty amphitheatre and into the picturesque dam behind the Sound Shell stage. “Some glass in the Sound Shell was damaged but repairs are already underway with the cost being met by insurance,” says Four Winds, Executive Director, David Francis. “Everything will be ready and waiting for the Easter Festival and plans are also being put in place to ensure that such an incident can never happen again. The car itself is a write-off, “unfortunately, for the lovely man who owned it, who is so desperately sorry and embarrassed,” Mr Francis says. Thankfully no one was in the Sound Shell and no one was injured. Photo: Supplied. Luckily, the car avoided the Sound Shell’s lights and electric meter box at the bottom of the stairs. Two wooden green seats were smashed, but none of the amphitheatre tiered terraces were damaged. 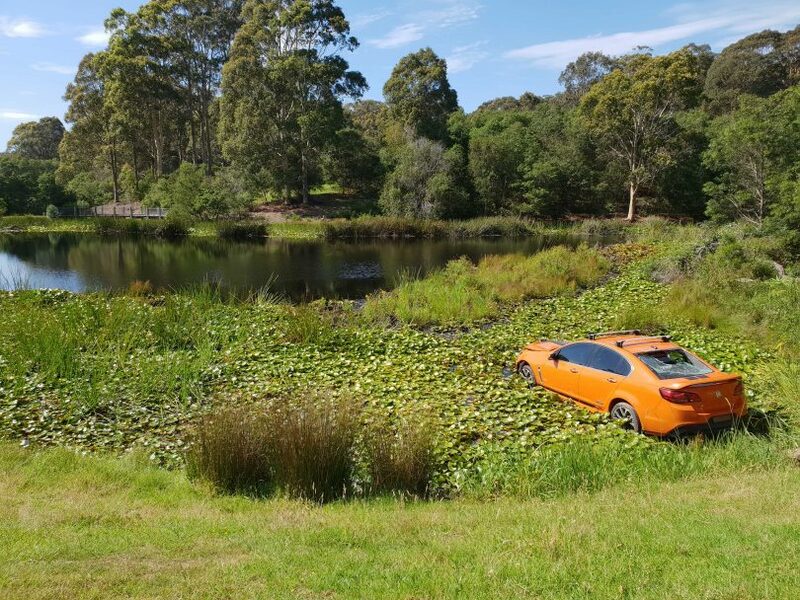 The car was airborne over the moat, and went across the stage and smashed through two panes of glass in the backstage glass wall and landed in the lilies of the dam. Big supports that hold the huge big Sound Shell roof in place were missed. “Quite a miracle really!” Mr Francis says. “We will take this opportunity to make amendments to our parking arrangements so this will never happen again. In true showbiz style, Malumba played on inside, launching their new album ‘The Passage’ which was recorded at Four Winds last year. Malumba, playing inside the Windsong Pavilion last Sunday, their new album is “The Passage’. Photo: Malumba Facebook. “We’d like to thank the Four Winds team who responded so quickly to the incident, ensuring safety procedures were immediately put in place, and the owner of the car, and his small party of friends, who were cared for and supported,” Mr Francis says. “One staff member drove them home to Tuross after the event concluded. The owner of the car has offered to come back and help in whatever way he can. The focus for Four Winds now is the upcoming Easter Festival which last time drew around 3,000 people. “Our Artistic Director, James Crabb, has put together the most fantastic program based around discovering something new, unexpected and seeing the more familiar presented in new ways,” Mr Francis says. 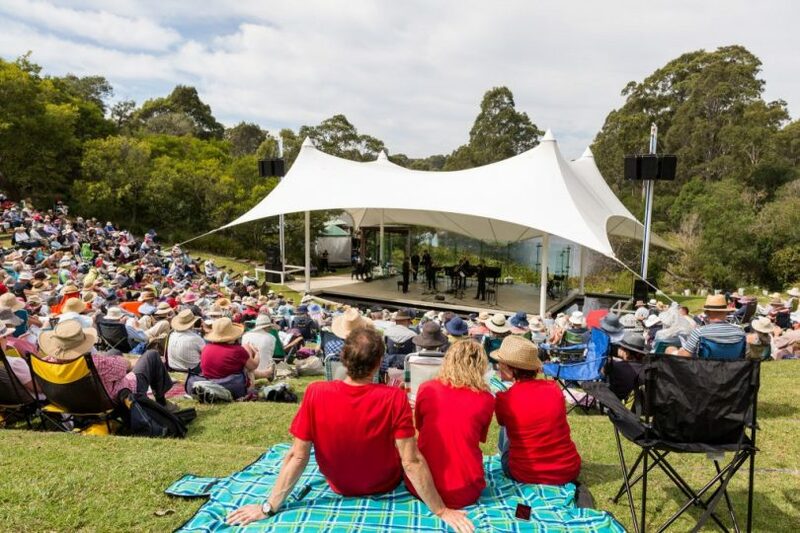 The iconic Four Winds Sound Shell in full flight at the 2018 Easter Festival. Photo: Four Winds website. 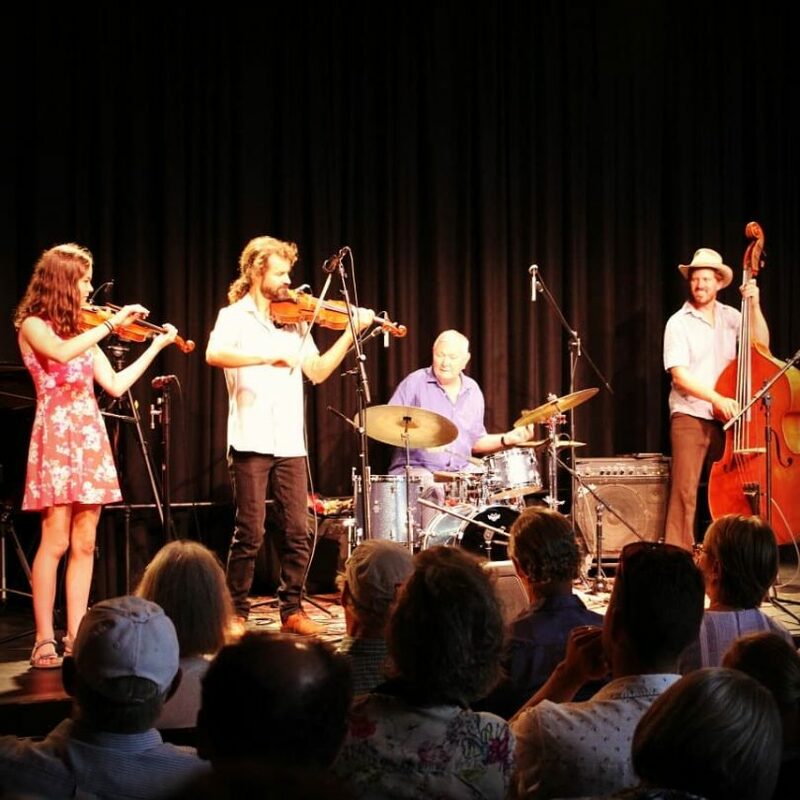 2019 marks the beginning of the Four Winds Festival again becoming an annual event – April 18 to 21, including major events in the Four Winds Sound Shell on Easter Saturday and Sunday as well as Windsong and house concerts, masterclasses, workshops, youth activities and free community events in and around Bermagui. Check the program at the Four Winds website.